Whoosh… the huge red paddle wheel churns up the silty Mississippi water as we set off from the port city of New Orleans. Our red and white steamboat has two fluted black funnels belching out steam and smoke while railings are draped in stars and stripes bunting to mark the boat’s 20th anniversary. After an overnight at the historic Bourbon Orleans Hotel in the lively French Quarter, I embark the American Queen and prepare for the 700-mile journey to Memphis, Tennessee. We set off on a humid June afternoon. It will get even hotter as we steam up this vast waterway – the third longest in the world. The Lower Mississippi delta is vulnerable to flooding and this year’s high spring tide means some riverside vegetation is still underwater, giving the scene an eerie feel. As the temperature climbs, I discover the itineraries will shift to the Upper Mississippi and Ohio rivers for the rest of the summer. The American Queen will not return to the delta until November. This alleviates the discomfort of 40C-plus temperatures and means the boat sails all year round. We will travel into the Deep South to visit Civil War sites and historic towns – including a pilgrimage to Graceland and Sun Records in Memphis, the boat’s home port – each stop recreating a time far removed from the present day. The Upper Mississippi is the scene of Huckleberry Finn’s adventures and during our trip, Mark Twain impersonator Lewis Hankins is present to give talks and performances about Samuel Clemens (Mark Twain was the author’s pen name). “All the boys in my hometown of Florida, Missouri, had one ambition – to be steamboat men,” says Lewis, in the character of Mark Twain. Since Twain’s time, the river has changed markedly, becoming straighter and losing about 400 miles of its 2,600-mile length. Onboard, however, it is as if you had entered a time portal. The Grand Saloon is particularly evocative with its velvet and fringe curtains skirting the light bulb festooned theatrical arch. The Mark Twain Gallery is decorated with Tiffany lamps, antique furniture and cabinets filled with memorabilia and taxidermy. The vaulted ceilings and chandeliers of the JM White Dining Room are an almost exact replica of those onboard historic steamboats. My stateroom has all the mod cons: air conditioning, hair dryer, bath and shower but otherwise, a distinctly Victorian decor. Lamps and pull cords have fringes, curtains are floral chintz and furniture is dark-wood antiques. Aft is the Engine Room Bar, which has televised sports and a popcorn machine. I have a cool cocktail, then take a stroll around the observation deck with its 37-pipe calliope musical instrument – concerts regularly take place outdoors. On the top deck (sun deck) is a small pool, a cardio room and lounge chairs, with plentiful seating under canopies. The 418ft boat has 222 staterooms, each with mahogany doors, and a draught of eight and a half feet, ensuring easy navigation of the river. Early starts for tours and meals suit American tastes. Breakfast starts at 6.30am and there are two sittings for dinner: 5.30pm and 8pm. Shows are 6.30pm for late diners and 8pm for the early diners. The Southern style cooking is very good, if calorific. The menu is a la carte and on the first evening, mains choices are surf ‘n’ turf or fried catfish followed by peach cobbler. 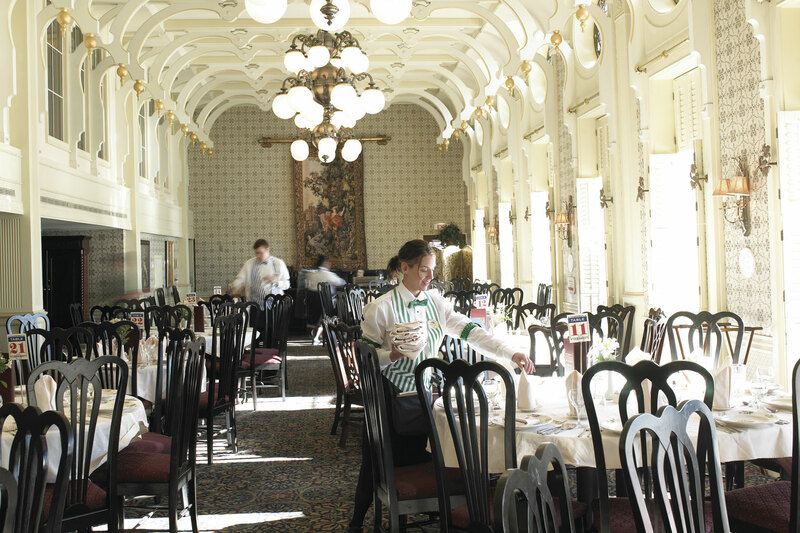 Breakfasts include Banana Fosters French Toast, while lunchtime buffets have Southern favourites country biscuits ‘n’ gravy or shrimp ‘n’ grits. Our first stop is Baton Rouge for Nottoway Plantation. The largest remaining antebellum plantation home in the South was built by John Hampden Randolph and completed just before the Civil War broke out. Displays of china, antique furnishings and portraits are representative of the period and place. Further up river and our vessel veers off into the Yazoo river for a stop at Vicksburg, Mississippi. The site of the most important Civil War battlefield and siege in the country is worth booking as a premium excursion. The metal gunboat, USS Cairo, sunk during skirmishes, is now resurrected and on show. Actors engage with guests to give a feel for what it would have been like to be a confederate soldier during that time. The best excursion is near the end of our trip. It is the blues and gospel tour at Helena, Arkansas. Here, and in neighbouring Clarksdale, it’s all about the music and the tour includes a visit to the First Baptist Church of West Helena to hear a gospel choir, as well as a stop at the Delta Blues Museum, located in the old Clarksdale railroad station. Bar, which has televised sports and a popcorn machine. I have a cool cocktail, then take a stroll around the observation deck with its 37-pipe calliope musical instrument – concerts regularly take place outdoors. On the top deck (sun deck) is a small pool, a cardio room and lounge chairs, with plentiful seating under canopies. The 418ft boat has 222 staterooms, each with mahogany doors, and a draught of eight and a half feet, ensuring easy navigation of the river. Early starts for tours and meals suit American tastes. Breakfast starts at 6.30am and there are two sittings for dinner: 5.30pm and 8pm. Shows are 6.30pm for late diners and 8pm for the early diners. The Southern style cooking is very good, if calorific. The menu is a la carte and on the first evening, mains choices are surf ‘n’ turf or fried catfish followed by peach cobbler. Across the street is the Ground Zero Blues Club, co-owned and operated by actor Morgan Freeman, where we take in some soul music and munch on Southern fried food. The first steamboats appeared on the Mississippi in 1812 and began moving goods, passengers and dreams up and down from the Minnesota headwaters to the Gulf of Mexico. This was well before the railroad had become the transportation of choice for the US. The American Queen’s paddle wheel powers the vessel, much like those on which she is modelled would have done 200 years ago. The wheel never stops turning as we make our way along the river – both a reminder of times gone past and the inevitable passage of time. This Lower Mississippi cruise will leave history buffs, and anyone interested in the South, thoroughly delighted. Book it: Titan offers a 15-day “Journey of the Mighty Mississippi” escorted tour from £3,499pp (travelling December 16, 2015), saving up to £400 on selected dates. Cost includes flights, seven nights onboard the American Queen, six nights in hotels, 11 excursions, 22 meals and Titan’s VIP Home Departure Service.